The Queen of the West End, Kerry Ellis is back with a new studio album – Golden Days. 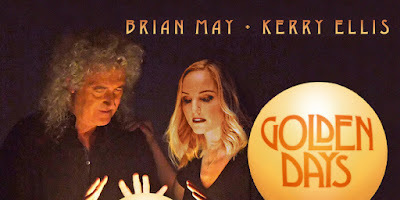 In collaboration with her long-term creative partner Brian May, of Queen fame, this exciting new album brings to the fore an exciting array of soft-rock, musical theatre and new original numbers sure to delight die-hard Ellis fans everywhere. However, this album is very eclectic and won’t be everyone’s cup of tea. We start with “Love In A Rainbow” and this pretty much sets the premise for the rest of the tracks. One of five new original songs on this album, its Grecian style chant at the beginning then turns into soft-pop before the introduction of sitars and a chorus. It’s mad but somehow it works... I think. Not every song pulls of this new wacky style of creative expression. Whilst listening to “Parisienne Walkways” I was hoping to be transported back to the days of Gary Moore and his iconic live performances, but I was left simply wanting more. May plays his best classic style on this track, but Ellis’s vocals just cannot match up to the original. “It’s Gonna Be All Right (The Panic Attack Song)” is a distinctly weak track. It’s resonant of a corny 90’s TV theme tune. “Roll With You” is energetic but ultimately forgettable. Unsurprisingly, it is the musical theatre repertoire and more gentle vocals of Ellis’s which shine on this album. We’ve all heard her sing Elphaba and we know she can belt the roof off any theatre so the serene and angelic vocals on some tracks here make all the difference. “If I Loved You” is a real classic and beautifully performed and similarly, the gentleness of “Can’t Help Falling In Love” also shines thanks to its calming simplicity. The pair’s rendition of “Amazing Grace” is as charming as any I’ve ever heard before. The collaborative spirit between May and Ellis is now clearly a well-oiled machine and the two are able to bring out the best of each other in today’s music industry. For Ellis fans everywhere, this is a brilliant new addition to your music library. I fear May fans may be disappointed as this sound is not resonant of that classic May sound his fans love so much. Nevertheless, it is a decent listen and worth streaming if you get the chance. Very much an album of hits and misses.